Good morning, Million Dollar iPad Tribe! Let’s explore some apps, shall we? MagicalPad HD is a fascinating outliner, note creator, mind mapping tool, and checklist generator. Now, I couldn’t pass it up just because of it’s name. Normally, this app is $9.99. Today, it is only $0.99. For those of you who know a bit about brainwave entrainment, you will find Brainwaves for Business Elite interesting. Here’s what the publisher says, “Using fine-tuned brainwave patterns with ambient music and natural sound, you will be able to reach an altered state of consciousness within minutes.” The app is FREE. For those of you who’ve already moved to or are in the midst of transferring to a paperless office environment, the time will come when you might need to add barcodes to your documents. By adding barcodes, you permit your digital document items to ultimately be read or input by a scanner. The information can then be placed into a digital format for later access, retrieval, and use. Unfortunately, there is no reliable all-in-one iPad app of which I’m aware that currently allows you to create a document and easily append a barcode. I’m sure someone will develop such an app as there is a need for that type of digital creation tool. In the meantime, here is the iPad integrated workflow process that I think works best for you. The is one of those methods that actually reads more complicated than it actually is to apply. STEP ONE: Create the document that you want to ultimately use with a barcode. You can produce the document in your favorite iPad word processing program (for example, UX Write, QuickOffice Pro HD,Pages, or DocsToGo. Alternatively, you can use a PDF creation program like iAnnotate, Save2PDF or GoodReader to create the document. My personal preference is to use UX Write or QuickOffice Pro HD as they provide you with an initial and more flexible word processing environment. They then easily permit you to save your document in PDF format from within the apps themselves. STEP TWO: Convert your document into PDF format and save it. Here’s a workflow model to help show you one of the options you have: Create your document in UX Write. Then, save that document as a PDF (you do this by tapping the folder with the arrow on the top right of your screen and selecting the “Create PDF” option). STEP THREE: If you have saved your PDF document in a word processing app, then use the “Open In . . .” option to open the PDF in your preferred PDF creation app. Continuing my example: Open the newly created PDF in UX Write. Tap the folder with the arrow on the top right of your screen. A menu of various apps will now appear that can read the PDF you have created. Tap the PDF Expert icon and the PDF will open and appear in the app. Using one of these sites, create the type of barcode that suits your particular needs. STEP FIVE: Save the barcode to your Camera Roll. Press and hold on the image you are given and save that barcode as an image onto your iPad. The image will be saved to your Camera Roll. STEP SIX: From within your PDF creation app and with your chosen document open, paste the barcode from your Camera Roll onto the document. So, continuing with our example: From within the PDF Expert app, tap the Stamp icon (which will now appear highlighted). Tap on your open document in the place you want your barcode to appear. This will bring up a menu that contains, among other things, a “Custom” option. Tap on the “Custom” menu heading. Tap on the “+” sign. Tap on “Image Stamp.” This will provide access to your Camera Roll. Tap on the barcode image from your Camera Roll and select the quality of the image you want to use. Your barcode will now appear on the document. You can move and resize it to suit your needs. STEP SEVEN: Save a copy of your barcode-adorned document. STEP EIGHT: When you are ready to use the barcoded document, tap the Send by Email button from the app you have chosen to use. MAKE CERTAIN THAT YOU CHOOSE THE FLATTEN COPY OPTION BEFORE SENDING. By flattening your PDF, you help to prevent manipulation of the barcode, among other things. Please note that not all word processing and PDF creation programs provide the same options. For the specific purpose of creating PDF documents with barcodes, I find that UX Write and PDF Expert are the most capable for my needs. The method I have just provided works well when you only have a few barcoded documents to generate. If you have a large quantity of barcodes and documents to create, I would use a desktop or laptop option. Oh, one last thing – you can use this process just as easily to create documents that have QR codes. The websites I have listed for you give you this option, as well. If you enjoyed this, I’d be grateful if you share this with others. That’s right, go ahead and help spread this information by emailing it to a friend, or sharing it on Twitter, Facebook, or Google+. And, if you’re interested in finding out how I can make a presentation to your law firm or association, please contact me at 909-483-1850 or email me at sgrossberg@cgclaw.com. © 2013 by Scott Grossberg. All Rights Reserved. Mr. Grossberg is a founding partner of the Southern California law firm of Cihigoyenetche, Grossberg & Clouse. He is a featured speaker and published author on numerous topics including media relations, social media, technology, public speaking, memory, and various other cutting edge concepts. 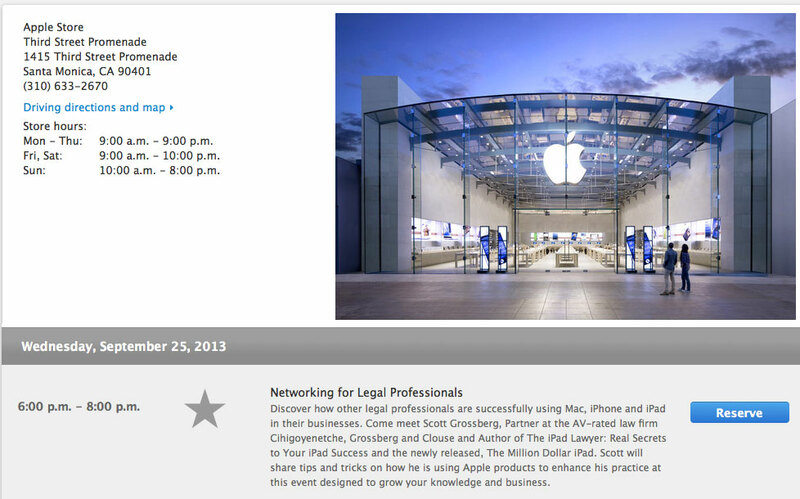 Mr. Grossberg’s “iPad Lawyer” and “Million Dollar iPad” seminars provide business professionals with the ability to truly harness the potential of Apple’s tablet. He is regularly called upon to address the impact of emerging technology and social media, suggest policies and procedures that should be in place, and to discuss liability exposure for this new way of doing business. He can be reached at sgrossberg@cgclaw.com. Just a reminder that I will be appearing for an Apple live event on Wednesday, September 25 at the Third Street Promenade Briefing Room in Santa Monica from 6-8p. Once again, I will be sharing some of my best-kept secrets for saving time and making money with Apple! Bring your questions. Bring your excitement. Most of all . . . bring yourself to this event. And Apple is making this FREE for you! Call Apple for reservations as seats are limited: 310-633-2670. By now you have probably updated to iOS 7. One of the most exciting benefits of this new iOS is the ability to put more icons/apps into one folder. Go ahead. Give it a shot. You do this the same way you created folders in the first place. Only now, you can have multiple pages of apps in one place. Some of you might have found it challenging to locate Spotlight after the update. From any primary screen (the ones with apps or folders on them), simply swipe down. Voila! Don’t forget that iOS 7 now provides automatic app updates. You can turn that off by going to Settings if you’re troubled by updates being self-activating. I look forward to seeing you at the September 25 Apple Store Event in Santa Monica! A reminder that I will be at the Fashion Island Briefing Room in Newport Beach TONIGHT from 6-8p. I will be sharing some of my best-kept secrets for saving time and making money with Apple! Bring your questions. Bring your excitement. Most of all . . . bring yourself to this event. And Apple is making this FREE for you! Call Apple for reservations as seats are limited: 949-629-9717. And, next week (Sept. 25), I will be at the Third Street Promenade for Apple from 6-8p. Naturally, everyone’s excited about tomorrow’s release of iOS7 for all capable iOS devices. Please make sure that you are religiously updating your existing apps before installing the new operating system. AND . . . MAKE CERTAIN THAT YOU HAVE BACKED UP YOUR iPAD BEFORE INSTALLING THE iOS7 (just in case). On the app front, lots of stuff today. My favorite drawing/sketching app, Sketchbook Pro is on sale today. Normally, $4.99, today it is only $1.99. For those of you who have moved to taking digital handwritten notes, you must explore Noteshelf. Normally it is $5.99. Today, it is a steal at $.99. Would you like to create voice memos? Then take a look at Recorder Pro: Professional Voice Recording On-The-Go. Normally, this app is $1.99. Today it is $.99. 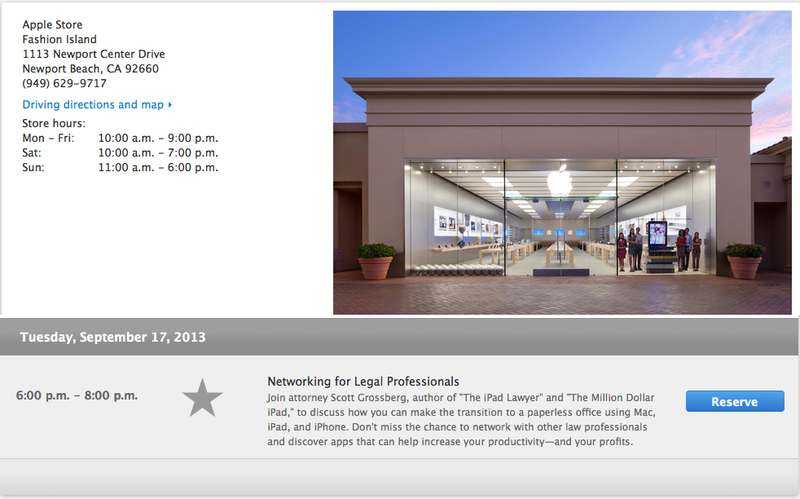 Tomorrow I will be appearing for a live event for Apple at the Fashion Island Briefing Room in Newport Beach from 6-8p. I will be sharing some of my best-kept secrets for saving time and making money with Apple! Bring your questions. Bring your excitement. Most of all . . . bring yourself to this event. And Apple is making this FREE for you! Call Apple for reservations as seats are limited: 949-629-9717. And there are a slew of additional events currently being planned for those of you in the San Francisco, Palo Alto, and Burlingame areas in early 2014. On the app front, there is a new calendar app from Readdle called Calendars 5. I’ve downloaded, tried, and rejected many different calendar apps. This is now my favorite one because of its ease of use, integration with reminders, and cross-device synchronization. Readdle describes its app like this: “Calendars 5 is a completely new app. In a nutshell, Calendars 5 is a smart calendar that understands human language and supports tasks and iOS Reminders. It has a clean design focused on your events. It just helps you to manage your day, week and life in general, and does it good. It’s a universal app, so runs on both iPhone and iPad.” My only criticism of this app is the inability to add invitees if you are using the iOS calendar (rather than Google calendar). However, there is a simple workaround using the native iOS calendar app if that’s important. Calendars 5 is currently $4.99. I expect that the price will be increased in the near future. For those of you who need to pitch an idea, explain an idea succinctly, or need help creating a case theme, you might find Connection Storymaker a way to help focus your thoughts. The app is $0.99. Well, as you know, there was no release announcement for new iPads. My rumor patrol indicates that might be coming in October! In the meantime, let’s get some awesome apps. One of my favorite PDF annotation tools is iAnnotate PDF. Normally, it’s $9.99. Today the price is only $1.99. If you work with PDFs, YOU NEED THIS APP. iAnnotate has just been updated, by the way, to do even more. You can modify and rearrange PDF pages. You can create brand new PDFs. There’s so much this does, you simply have to look at one of the following links and you will be convinced that this app must be in your app success library. For those of you who are involved in training, take a look at DesignJot. Normally, $4.99, it is FREE today. DesignJot allows you to create training objectives, identify and plan key learning activities, sketch activity mockups, and categorize key content. I’ve used DesignJot to create some of my iPad training events. Finally, your kids are all using this new social media tool. You should be aware of it. It’s called SnapChat and it’s FREE. Billed as real-time picture chatting, it allows photos and video to be sent to someone. The image is viewed and then automatically vanishes (you set the timer for up to 10 seconds). Of course, someone can still take a screenshot of what you send them. (Oh, and I wouldn’t presume that the image can’t be recovered at a later time.) Still, this is the new thing! For those of you in the Southern California area, I will be appearing for a live event on September 17 at the Fashion Island Briefing Room in Newport Beach from 6-8p. I will be sharing some of my best-kept secrets for saving time and making money with Apple! Bring your questions. Bring your excitement. Most of all . . . bring yourself to this event. And Apple is making this FREE for you! Call Apple for reservations as seats are limited: 949-629-9717. On the app front, uDictate: Medical, Legal & Professional Dictation is a reduced price today. Normally, this app is $8.99. Today, it is $6.99 (a $2 savings). You can record in PCM (.wav, .aiff, .caf), AAC (.m4a, .caf), IMA4 (.aifc, .caf) formats. There is also a FREE version available (with a recording time limitation) if you just want to try it out.